You wake up one morning and you feel body aches, pains, and fever. These symptoms could mean that you have either the flu or a common cold. If you have the flu, a medical professional may prescribe antiviral medication to help ease your symptoms. Since colds and the flu have similar symptoms — such as body aches and fever — it can be hard to determine which type of illness your body is fighting. Excessive fatigue. While you may feel tired and run down with a cold, the fatigue caused by the flu is severe and is sometimes the first symptom you will notice. Body aches and chills. If you have the flu, these symptoms will be severe, unlike the mild aches typically caused by a cold. Cough. A persistent cough accompanied by wheezing and chest tightness may indicate the flu. Sore throat. While a sore throat often signals the onset of a cold, a sore throat that is caused by the flu will usually worsen as the virus progresses. Fever. A fever associated with the flu may exceed 100 degrees. A cold may cause fever, but it is usually mild. Gastrointestinal disturbances. Diarrhea, nausea, stomach pain, or vomiting can accompany the flu, especially in young children. These symptoms are not often associated with the common cold. If you are unsure what is causing your body aches and fever, you should see a medical professional who can diagnose your illness. If necessary, they will prescribe an antiviral medication or recommend appropriate over-the-counter remedies. 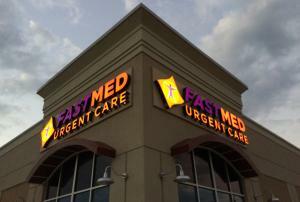 FastMed Urgent Care is available when you need us. We hope to treat your flu virus before your body aches and fever symptoms become too severe. Prescription antiviral drugs for the flu should usually be taken within two days of the onset of symptoms, so don’t hesitate! We are open for extended weekday hours and on the weekend, and you never need an appointment to see one of our medical professionals. We’ll have you in, out, and on your way usually in under an hour. Don’t let body aches, chills, and fever slow you down. Visit your local FastMed Urgent Care for caring, compassionate, and affordable care.